HAVANA (AP) — Cuba has announced the withdrawal of its ambassador and diplomatic mission in Libya and reiterated that it does not recognize the rebels' transitional government. It also has denounced the NATO military intervention that helped drive Libyan leader Moammar Gadhafi into hiding, saying the bombing killed "thousands" of civilians. It warned that NATO's conduct could create similar conditions for an outside military intervention in Syria, which has been roiled by popular protests as well. 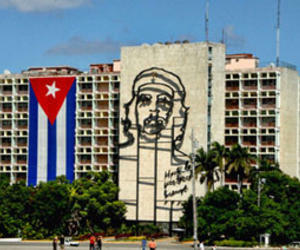 Cuba is a longtime ally of Libya, and former leader Fidel Castro was outspoken in his criticism of the uprising against Gadhafi in the early days of the conflict. He has not commented publicly on Gadhafi's fall. The announcement came in a Foreign Ministry communique on Saturday.